I seem to get involved with some bizarre stuff. I suspect it is because I know some strange people. Dave from Chunky Tread being one of them. Via connections from the Manchester Bike Show Dave got the Chunkies invited to do our thing at this year's Llangollen Bike Fest. No, I'd never heard of it either. Friday sees me taking the 75 mile ride down to the campsite. Abbey Farm is about a mile or so from Llangollen Pavilion where the event is held. I pitch up then myself and several other chunkies ride to the Pavilion to set up. I'm struggling to see where Abbey Farm Campsite gets it's name from. There's nothing fancy, for us there's a patch of grass and a couple of trees. Fear not - we're wild adventurers! We (well, some of us) have seen the world! We need nothing more than a patch of grass and our bikes and we'll be happy. No, really, this is ideal. Later it would prove to be more than ideal. We are here to do nothing more than show our bikes and talk to folks if anyone asks. I get the feeling this will be a chilled out weekend. The evening is spent chatting back at the campsite. I know a few people well, a few fairly well and a few I've only met once before. It's very calm and civilised but I can sense people getting tipsy and I'm ready for bed. Just chilling out and chewing the fat. It's not rocket science. Saturday dawns. The skies are hazy. After ablutions and breakfasts several of us hop into the back of Dave's van and head to the show. 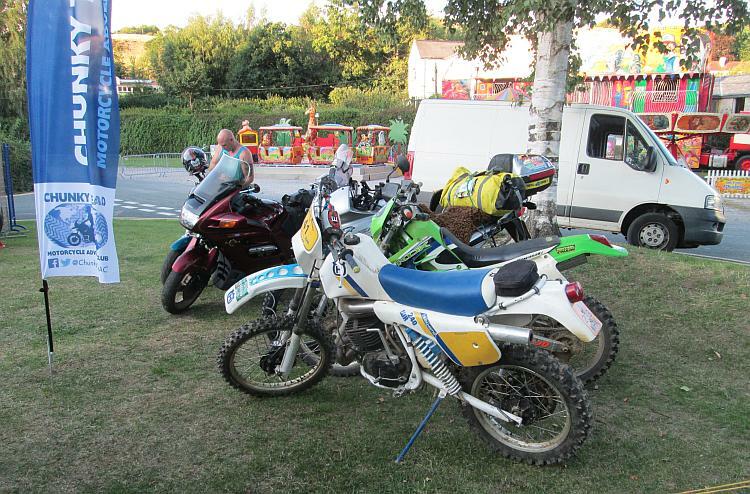 So what is the Llangollen Bike Fest? I think it'll be easier to inform you what it at the Bike Fest and let you decide. There's the Chunkies of course. 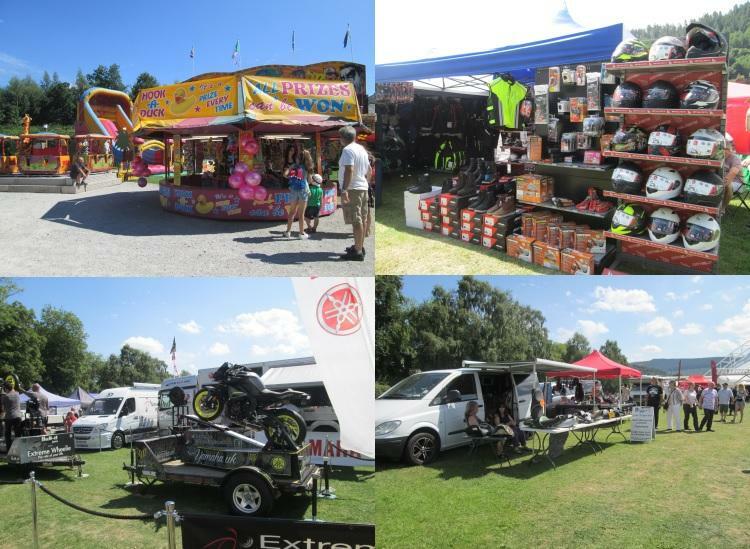 There are quite a few stalls selling everything from old bike bits and hippy trinkets, then the usual clothing and accessories, then on up to official Suzuki and Triumph displays. There's a trials area with bicycle and trials riders hopping over stupendous objects and the like. There are plenty of food vendors from ice cream to posh sausages. There's even a stage with singers and bands mixed in with entertainment for the small people. It's quite an eclectic mix. Well I did say eclectic. At the centre of all this is a large pavilion filled with various motorcycles, mostly old ones. There's a stage too with ongoing interviews with various motorcycling celebrities including John McGuinnes and Zoe Cano for example. There's also a small room with projector and a selection of talks from various well travelled riders. I watch Bernard Smith's presentation as he tries to hold his emotions in check. I take in Steve Stewart's tales of misadventure in South America. Duncan Gough's impassioned enthusiasm for all things Spain is now much more relevant to myself. I also enjoyed Jacqui Furneaux's tales of random unplanned adventures. 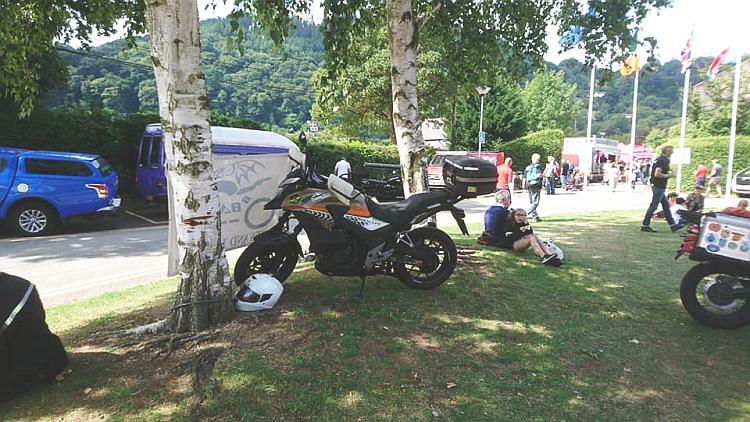 In the meantime my CB500X is proudly placed atop a hump of ground between 2 trees with the BAT banner unfurled beside. I don't know if anyone noticed, I suppose one or two did as a couple of the flyers seem to have been taken. Shameless self promotion. A few people commented about the 500 being a good looking machine. The Saturday was busy. 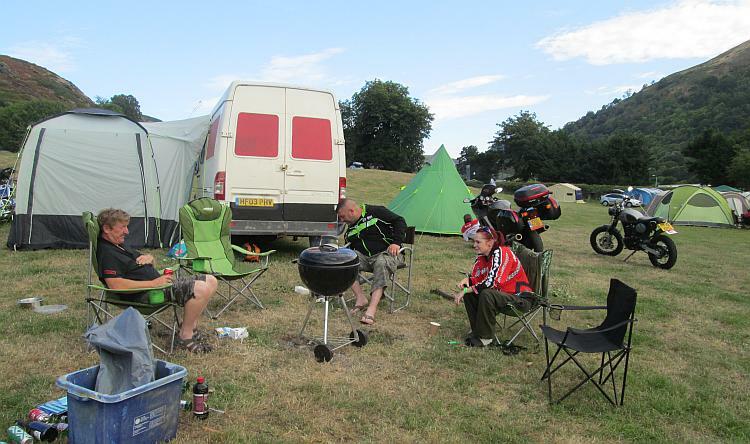 The Saturday night at the campsite was equally sociable as the Friday night. The Saturday night and early Sunday morning proved to be a little chilly in the tent but not insufferably so, I needed to zip up the sleeping bag that's all. Sunday brings more and more punters to the show and the sun beats down hard. Remember I mentioned the trees on our patch of grass? They are providing perfect shade. As the chunkies come and go those on the pitch sit around and stay cool in the shade. The sun and temperature rises and we are joined by all and sundry seeking a rest for their tired feet and respite from the sun. The chunky stand is the place to be. I don't know how much exposure Chunky Tread or Bikes And Travels got at the show. To be frank I don't care. I've spent a weekend hanging out with friends and acquaintances in glorious weather. 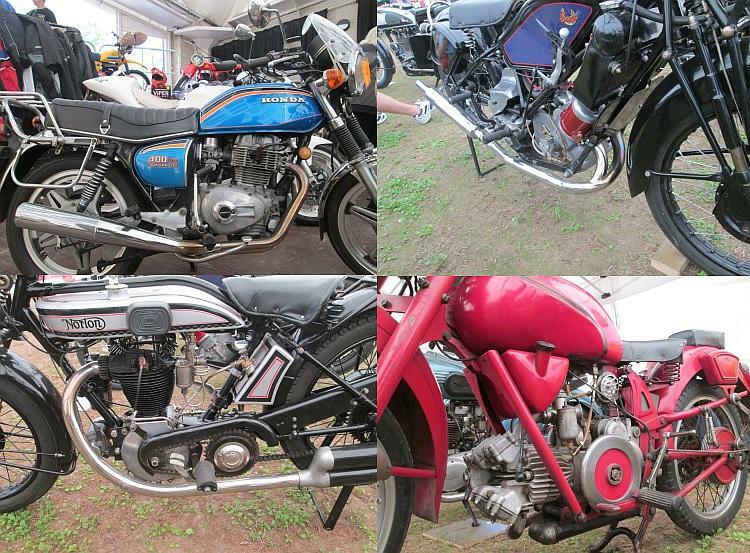 I've spent a weekend hanging out at the Bike Fest. I've had a good weekend, I think we've all had a good weekend. If we did a little promotion then that's a bonus. Shame I missed ya Borsuk. What time did you get to the Fest? I think it was just after 2 pm on the Sunday. Gosh darn it, I was there but I could have been anywhere, I didn't hang around by the bike.